Tibbit #48 has two 3.5mm stereo jacks on the front of its C2 section. The left jack is for connecting to a stereo microphone, and the right jack is for connecting to stereo headphones or an external amplifier. 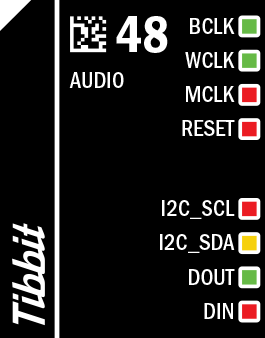 The Tibbit is based on the TLV320AIC3105 audio codec IC. The clock frequency is supplied via the MCLK (master clock) line. 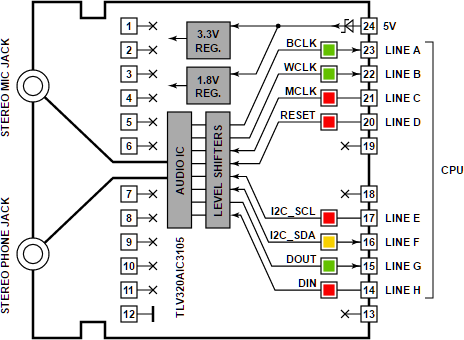 BCLK and WCLK clocks are generated by the audio IC and are fed back into the sound port on the LTPP board's processor. The audio data is transmitted via DIN and DOUT lines. There is also an additional I2C port (SCL and SDA lines) that is used for configuring the codec. There are three green, four red, and one yellow LED. Green LEDs are connected to BCLK, WCLK, and DOUT lines. Red LEDs are connected to MCLK, RESET, I2C_SCL, and DIN lines. The yellow LED is connected to the I2C_SDA line.